Westport was the location for filming of Episode 2 of Dynamic Range video series. The first day’s filming was from Old Head, Westport, Co Mayo. Using the famous Croagh Patrick Mountain as our bacground. During the filming of the introduction it started to rain and the clouds started to roll in thus putting an end to the planned sunset image. However, all was not lost and the clouds did break and the resulting image above was taken. 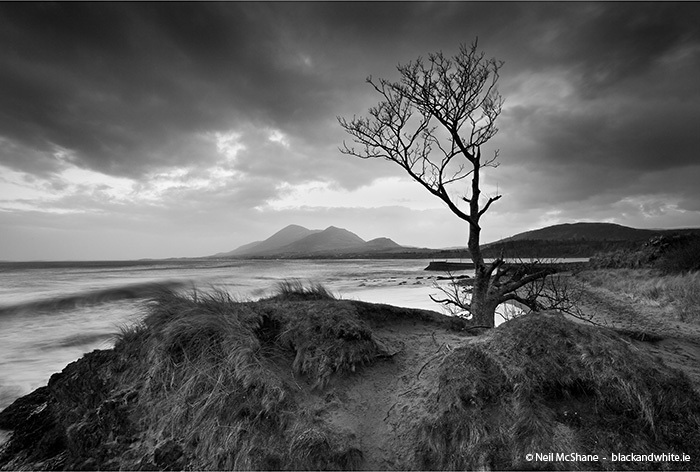 Using the clouds to aid the composition and draw the viewer into the image is what makes this image. The long shutter speed has added drama to the waves.